In the 1980’s, producers of eco-friendly textiles generally worked under the umbrella of organic food associations. However, they found that the food association was impractical for textile producers because although the growing and harvesting of food and fiber crops were similar, the processing of fibers in preparation to make fabric varied widely. The organic food associations were concerned primarily with food related issues. In addition, organic fabrics and fashion was being shown in specialized stores rather than in organic food markets. In 2002, at the Intercot Conference in Dusseldorf, Germany, a workshop with representatives of organic cotton producers, the textile industry, consumers, standard organizations and certifiers discussed the need for a harmonized and world-wide recognized organic textile standard. The many different standards, they felt, was causing confusion and acting as a obstacle to international exchange and recognition of organic fabrics. As a result of this workshop, the “International Working Group on Global Organic Textile Standard“ (IWG) was founded, with an aim to work on the codification of various regional approaches and to develop a set of global standards. Members of this group included Internationale Verband der Naturtextilwirtschaft e. V.“ (IVN), the Organic Trade Association (United States), the Soil Association (England) and Japan Organic Cotton Association (Japan). In 2006, their work was published as the Global Organic Textile Standard (GOTS) , which has since evolved into the leading set of criteria in the field of organic textile processing. A main achievement of this group was the ability to compromise and to find even consensus for points that were considered to be ‘non-negotiable’. Not all standard organizations that participated the process ended up with signing the agreement of the Working Group. From the GOTS website: “Since its introduction in 2006 by the International Working Group on Global Organic Textile Standard, the GOTS has gained universal recognition, led to abolishment of numerous previous similar standards of limited application and has become – with more than 2750 certified textile processing, manufacturing and trading operators in more than 50 countries and an abundance of certified products – the leading standard for the processing of textile goods using organic fibers, including environmentally oriented technical as well as social criteria.” This is a major accomplishment, especially given the global nature of the textile supply chain. Beside the technical requirements a certifier has to meet to become approved by the IWG for GOTS certification, it is also a prerequisite that he discontinues use of any other certification. 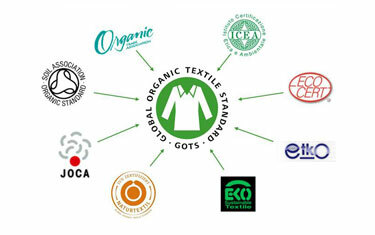 This measure was chosen to support the goal of a harmonized Global Standard and related certification system that allows certified suppliers to export their organic textiles with one certificate recognized in all relevant sales markets in order to strengthen the awareness and market for organic textiles. GOTS aims to define a universal standard for organic fabrics—from harvesting the raw materials, through environmentally and socially responsible manufacturing, to labeling—in order to provide credible assurance to consumers. Standards apply to fiber products, yarns, fabrics and clothes and cover the production, processing, manufacturing, packaging, labeling, exportation, importation and distribution of all natural fiber products. GOTS provides a continuous quality control and certification system from field to shelf. A GOTS certified fabric is therefore much more than just a textile which is made from organic fibers. Why is this a big deal? As we’ve said before, it’s like taking organic apples, and cooking them with Red Dye #2, preservatives, emulsifiers, and stabilizers – you can’t call the finished product organic applesauce. Same is true with fabrics, which contain as much as 27% (by weight) synthetic chemicals. And in today’s world, with the complex supply chain that multinational companies like Wal-Mart, Nordstrom and Levi’s use, this is a very big deal. As companies attempt to get a handle on their suppliers and maintain quality control, the list of universally understood environmental criteria in GOTS is coming in handy. While consumers probably won’t see a GOTS tag on conventional cotton jeans, some companies are asking suppliers to use only GOTS-certified dyes and chemicals on conventional cotton clothing. In fact, the companies mentioned above, along with Banana Republic, H&M and Target are just some of the companies that plan to use GOTS certification for their organic products. Harvesting criteria which requires the use of from 70% to 95% organic fiber. Environmental manufacturing practices, with a written environmental policy, must be in place. Environmentally safe processing requirements, which includes wastewater treatment internally before discharge to surface waters, must be in place. This pertains to pH and temperature as well as to biological and chemical residues in the water. Environmentally sound packaging requirements are in place; PVC in packaging is prohibited, paper must be post-consumer recycled or certified according to FSC or PEFC. Labor practices are interpreted in accordance with the International Labor Organization (ILO – no forced, bonded, or slave labor; workers have the right to join or form trade unions and to bargain collectively; working conditions are safe and hygienic; there must be no new recruitment of child labor (and for those companies where children are found to be working, provisions must be made to enable him to attend and remain in quality education until no longer a child); wages paid must meet, at a minimum, national legal standards or industry benchmarks, whichever is higher; working hours are not excessive and inhumane treatment is prohibited. There are requirements surrounding exportation, importation and distribution of all natural fibers. In June, 2011, The Global Organic Textile Standard launched an open comment period on it’s first revision draft of the new GOTS version 3.0. Following this announcement, IFOAM collected comments from its members and related stakeholders in order to shape the position of the movement towards the Global Organic Textile Standard. to further restrict the use of synthetic substances, possibly switching to a positive list of allowed substances, instead of a list of forbidden ones. to add requirements to ban the deliberate use of nano-technologies in the textile processing. GOTS is a positive ethical choice among both consumers and producers and is the most comprehensive in terms of addressing environmental issues. Although it is difficult to obtain, it can lead to important strategic business benefits.